This is a fun and different way to have burgers. The soft flatbread is a special treat. condiments of choice – onion, lettuce, tomato, ketchup, mustard, mayo, etc. 1. Pre-heat your oven to 350 degree, or heat outdoor grill. 2. Cook strips of bacon until crisp. Set aside. 3. Divide meat mixture evenly into 4 patties. Gently form the meat into half-moon patties. 4. Drizzle a small amount of olive oil on each burger and season liberally with salt and pepper. 5. Heat your grill pan or grill to medium heat. When hot, add burgers and cook for about 4-5 minutes. Then flip and cook for about 3-5 minutes longer. 6. When the burger is cooked to your preference, remove from the grill or grill pan. 7. Arrange flatbreads on a baking sheet. 8. 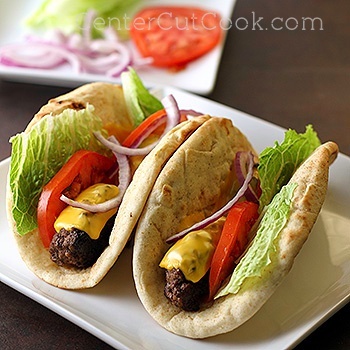 Arrange the burgers on a flatbread. Top with cheese and place in the oven or back on the grill for 5-10 minutes or until the cheese is melted and the flatbread is heated through. 9. Add 2 strips of bacon to each burger and then your favorite condiments.